For the man who truly wants to stand ouf from the crowd the 7 degree wood grain titanium band is the hands down choice. 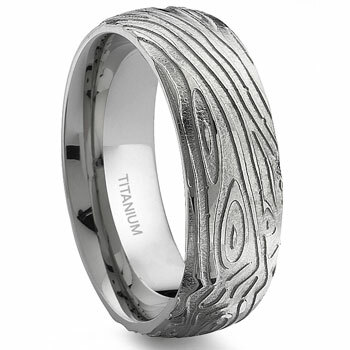 Crafted of gray high polish titanium with a wood grain design that runs the entire top surface of the wedding band. This is design technology that cannot be found on wedding rings made of the more traditional precious metals gold, silver, or, platinum. Not only is this a great wedding band but it will be a conversation starter for as long as it is worn. When it comes to wedding bands, women aren’t the only ones who prefer to have a large assortment of stylish options available to them. 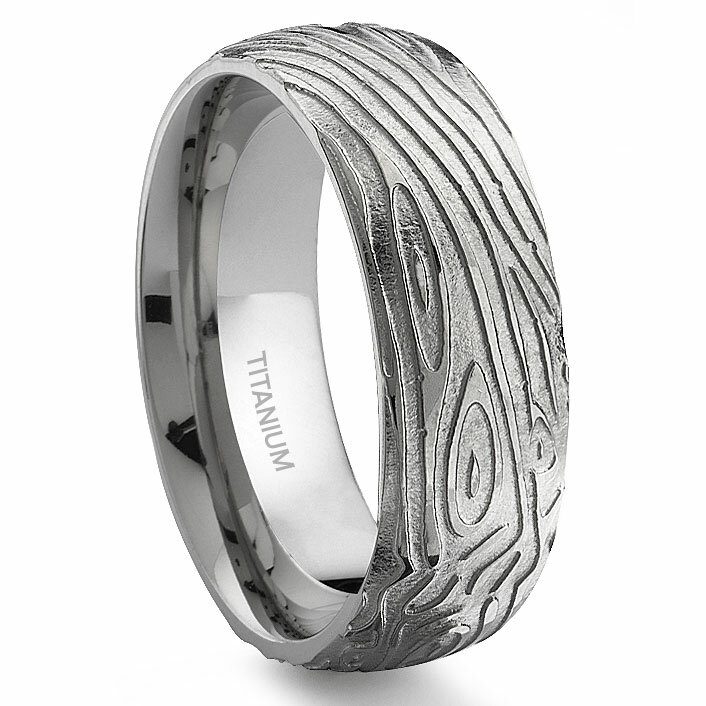 Men’s wedding bands are important because they are a symbol of the unique union between two people. The ring may look heavy but it is very light and manufactured with comfort fit design making it the perfect selection for a lifetime of wearing comfort. Rating: 5 / 5 , based on 12 reviews. Purchased this for our wedding, my finacee is a wood turner and metal worker, and the ring is gorgeous! It looks so nice with his titanium watch. He was thrilled and I was thrilled with the super price! It was the exact width I wanted, and looks great on his hand. Would buy from here again in a heartbeat! We both love the ring. It has a unique look to it and is light. We are thrilled!!! Would order from here again in the future. The ring arrived quickly and I am very impressed! It is light but still has an expensive feel and the detail is wonderful. The packaging is also unique and elegant; I can barely wait for our wedding day to surprise him with it! Thank you, Titanium Kay for offering such quality and uniqueness at a great price! This ring was shipped very promptly. When I received it, it was too big for my husband. I saw that the address was in LA, so I called up and asked if I could just exchange it in person. They let me exchange it without any hassles and voila! it fits perfectly. I ordered this ring for my husband who's hobby is woodworking. We received the ring promptly with no problems and it is beautiful. It looks even better in person. My husband says that it is very comfortable. A wonderful ring at a great price! I just have 1 word to say about the ring. AWESOME!!! My fiance works with wood alot and when I saw this ring I knew it was made just for him. It looks 100% better then the picture. I recommend this ring to everyone. I LOVE IT!!!!!!! I got this for my husband for Christmas and he truly loved it. It's unique and detailed. he has gotten many compliments. Thanks! My boyfriend just loved this! The wood grain looks even better in person than it does on the internet. I had to return it for a new size, and they were incredibly prompt in doing so. Great customer service AND a great ring! I really like this ring. It showed up sooner than I thought it would and it looks great.